I wonder whether cat boredom is a greater problem than we think. If we think about it at all. I mean we just can’t tell. 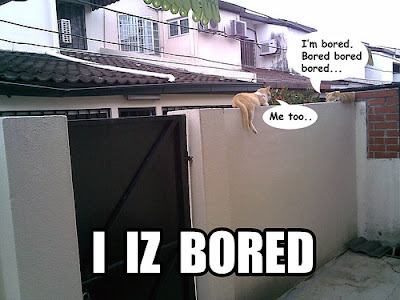 Cats sleep a lot and can look lazy but we don’t often see tangible symptoms of boredom. Relatively few people search for information about boredom in cats on the internet indicating an lack of awareness of or interest in the problem. The Cat Owner’s Home Veterinary Handbook refers to cat boredom on four occasions by reference to its index. Boredom can reduce fertility. In a cat that is already slightly deficient in this regard, it could be an important factor. I have made this point before and I am glad that the authors of this fine book agree with me. By unacceptable behavior we most often mean behavior that we find unacceptable but which is normal for the cat under certain conditions one of which is the lack of an outlet to express normal behavior. Bored cats can behave badly. The answer is to entertain and amuse them. I understand the pressures on our time but a duty to our cat demands that some time be given to them for play. Homemade cat toys are cheap and just as good as commercial available ones such as the remote controlled cat toy. An example of a simple homemade cat toy is the bug jar cat toy. Cat boredom can lead to cat stress and cat inappropriate elimination, which is the most common reason for cat relinquishment. Cat boredom amongst other emotional states such as stress, deprivation of freedom or being confined in small spaces for long periods, can lead to a cat grooming excessively. This is called “psychogenic alopecia” as it leads to hair loss (“alopecia” means loss of hair from body and/or head while “psychogenic” means originating in the mind – mental/emotional processes). The cat over grooms as a displacement activity. Another example of displacement activity that is not harmful to the cat is licking the nose when undecided. It appears that Siamese, Burmese, Himalayans and Abyssinians are more prone to this condition. A visit to the vet will be required to fully diagnose and rule out other causes. A bare abdomen or a stripe down the back is a sign1. Walking your full-time indoor cat can help. Cats may comfort eat as we do. They eat from being bored and might ask for food despite not being hungry. We can foster this situation by responding and feeding. Habits and routines are set up. Cats are creatures of routine. Over eating can lead to cat obesity and that in turn can lead to other health issues such as feline diabetes. 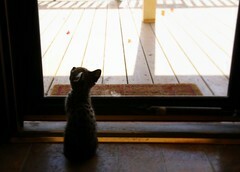 This entry was posted in Cat Behavior, Human to cat relationship and tagged cat boredom, cat emotions by Michael Broad. Bookmark the permalink.